Is Your Blog Destroying Your Website's Performance? Worse: your die-hard commitment to churning out dull prose about yesterday’s car accident on the intersection of Main and Walnut, is most likely hurting your site’s performance. YES – content hurts – and the mind numbingly dull news rewrites being dumped into blogs on a daily basis pollutes not just the internet as a whole, but the ability of your site to generate traffic… traffic from people who are looking to hire you for your car accident expertise, instead of the slip and fall accident reported first in the Local Herald back in November of 2012. Seems that all of those SEOs exhorting you to write more have forgotten about the apparently forgotten… Panda. The penalty that looks for dull, thin, poorly written garbage content and enacts a site-wide penalty – which hits the few good pages you do have. In the graph below… note the outlier down at the bottom right hand corner. This law firm has invested thousands of dollars barfing vapid content at a regular pace of 4 posts a week for the past two years. They wanted to know if… if… they should continue their content strategy (I shudder to actually write “content strategy”). And yet – over the past 3 months more than 82% of their pages had not delivered a single visitor. I plotted a few of our long-term regular clients to provide some perspective – other sites saw between 25% and 88% of their pages generating SEO visits (and you can bet we aren’t pushing more content to that one site sitting at 25%). 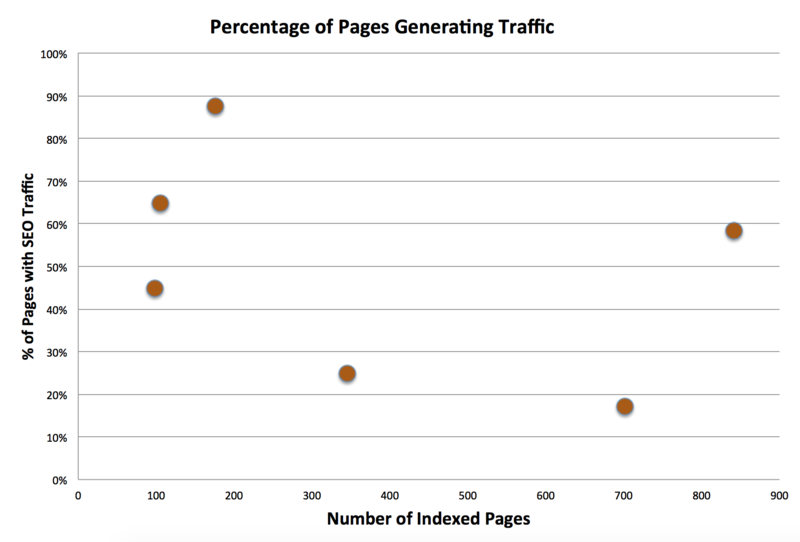 Note that it is not just volume of content – one site with close to 900 pages has almost 60% of them driving visits. So…. if you find the ratio of pages to landing pages below the 25% benchmark… perhaps your problem really is content. Too much of it.